Sweden is experiencing “an unusual season”. Last month reported the hottest May in Sweden for many years. The past few weeks (in fact the past two months) have been particularly warm and mostly pleasant for us as we’ve travelled along the Northern European coast. We don’t know any different though. Blue Heeler sailed from Sassnitz on Germany’s Ruegen Island and headed to Rønne on the east coast of the Danish island of Bornholm. The distance is 56nm and sailing along with a fresh breeze we arrived mid-afternoon at the small hafen. Here we went to the self-service bowser and topped up with 200 litres of diesel – DK11.50 per litre (that’s around A$2.50 per litre – you can understand why we must sail as much as possible!). No box-berths here, just normal floating pontoons. A couple of days at Bornholm, taking a day to enjoy a cycle around, the wind turned favourable for a sail to the small Swedish island of Hanö, another 56nm further north. There’s not much to do on Hanö except walk up a hill to the lighthouse in the centre, which is only ten minutes from the harbour. It’s charming though and dotted with wooden cottages and sheds painted in Falu red (a pigment from copper mines), ubiquitous to Sweden. The following day the wind wasn’t as strong as previous days, and it was a headwind, so we managed a slow 28nm in eight hours of tacking and motor sailing to arrive at the tiny harbour of Utklippan. Utklippan consists of two small islands or skerries – the north skerry is where the harbour is located, while the south skerry has the lighthouse and cabins. The lighthouse is disused and the few cabins cater for a maximum of twenty guests. The harbour has enough dock for passing yachts (five boats during our stay but apparently over the busy summer season up to fifty boats cram in!). Utklippan is a haven for reptiles (particularly frogs), birdlife and seals. The latter were easily spooked when we snuck out from behind a rock to witness them darting into the sea.The friendly harbourmaster suggested we walk up the lighthouse for a good view, so we did. The 122 steps to the top is worth it for excellent views of the harbour. The harbour has a couple of dinghies available to quietly row from one island to the other without disturbing the local bird life with noisy outboards. 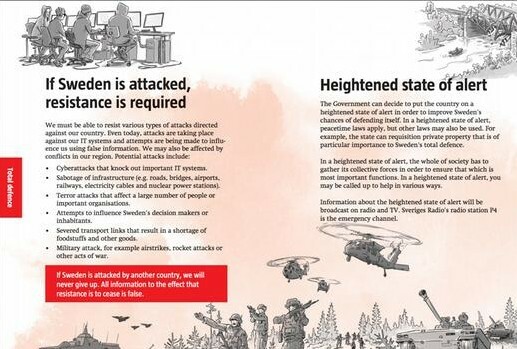 A few days before arriving at Utklippan, the Swedish government issued an important pamphlet to citizens warning them of a “heightened state of alert” and what to do when an attack is imminent; obviously not directed at our arrival, but more so to the provocative neighbours to the east. The harbour master at Utklippan reckoned there was a good possibly of lurking Russian submarines not far away. That night we were inspired to rewatch The Hunt for Red October. Entry at Kalmar, just in case you weren’t sure! Leaving early from Utklippan we tacked our way north until we reached the medieval town of Kalmar. The first noticeable building is the Kalmar Slott (castle), with origins from the 13th century and looking pretty much now as it did in the 1600s. The old Hanseatic city has stunning historic buildings surrounded by ramparts and segments of old wall. The Kalmar Cathedral is stunning, and taking a late afternoon walk around the historic town is a rewarding experience. We stayed at the Kalmar Gästhamn (guest harbour) a couple of nights to provision and ride around. There is a good chandlery opposite the harbour office so we bought a couple of Swedish sailing guide books – Hamnguides. The text is Swedish but the sample charts and diagrams are good, and we use Google Translate to translate the text. Our cruising kitty is certainly getting a little bruised in this region. Sweden is second on the list of EU countries with the highest VAT of 25%, equal with Denmark. Alcohol is very expensive and can only be bought from Government run liquor outlets known as Systembolaget. Despite this, they have a great selection of wines, liquors, beers, etc. but for a few dollars more. Beer up to 3.5% can be bought from supermarkets. Even though some things are expensive, marinas are comparable to Australian marinas, with the off season rates anywhere from SEK150 to SEK300 (around A$22 to A$50 per night). And of course anchoring is free and abundant which helps keep things under control. It’s around this area where the famous Swedish archipelago begins. Over the following ten days, and blessed with extraordinarily warm weather, we anchored in various bays taking in walks through pine forests, reading or knocking off a few onboard jobs while our cruising kitty licked its wounds. Although the air is warm, the water hasn’t caught up and is still very cold (around 17degC). On a lazy afternoon I decided to clean above the waterline so to keep warm I donned my wetsuit and booties and sat astride the dinghy to scrub, while Wayne worked on removing dirty fuel in our outboard. There’s always plenty to do. Between 10pm and 3.00am the sky is never really dark. Normally my rise and fall are synchronised with the sun, so it is in Sweden. This means I’m falling asleep around midnight only to awake at 4am sunrise. Heavy duty foil placed over the small porthole to blank out the sunshine and a heavy towel hanging in the ‘hallway’ to remove any trace of seeping sunshine helps darken the cabin and give us a few more hours of sleep. The island of Götland was recommended as a must-see place to visit, but with ideal winds still a few days away, we decided to head into Västervik Gästhamn. (Björn Ulvaeus from ABBA comes from Västervik so we kept our eyes open in case we ran into him!). This was a good stop and a great place to provision with a huge ICA Maxi and Biltema department store 4kms away (a 15 minute ride). I was surprised there wasn’t more boats. We didn’t even have to tie up to the stern moorings as there was plenty of dock space. Västervik was also a good place to meet up with friends. We first met Karl and Elisabet from “Spray” at Hemingway Marina in Cuba, then sailed on and off with them along the Antilles over the following months. While their Hallberg Rassy is on the other side of the world in New Zealand, they are in Sweden for summer and generously invited us to their summer home a couple of hours away from Västervik. The wind forecast for later that week was ideal for a sail to Visby, the UNESCO World Heritage Hanseatic Town at Götland around 54nm to the east. Back on board but this time with two extra crew as our friends joined us for what turned out to be a fantastic day’s sail, averaging 7kn! The wind increased to 25kn as we approached Visby Harbour, but with three crew helping the skipper, we bounced into the harbour, dodging a departing ‘Destination Götland’ ferry, furled the sails, docked, and had the cold beers out in no time! That night we watched the sun go down… unlike the lower latitudes, this took about ten minutes for the sun to finally plop out of view. Visby was the main centre of the Hanseatic League in the Baltic from the 12th to the 14th century and is the best-preserved fortified commercial city in northern Europe, with more than 200 warehouses and fancy dwellings housed within the 13th-century ramparts. We stayed on in Visby one more day as our friends caught the ferry back to the mainland the following day. It was great to have such nice people aboard and sail with us! But it’s not all ramparts and buildings – that day and night held the Swedish traditional ‘Studenten’ – the graduation from upper-secondary school when a teenager goes from being an upper-secondary school student to becoming eligible to enter University (much like Schoolies in Australia, but more family orientated and not as disorderly). The tradition begins with a Champagne breakfast at school, then the kids run out of the school building to waiting parents, family and friends bearing gifts. Tractors tow truckloads of celebrating students, while massive speakers blare out ‘doof-doof’ sound as they circle the town. They finished up near us on the beachfront for the revelry, drinking and dancing to continue into the night. The next day we motor sailed on light winds around to the north to Farö and the small fishing harbour of Lauterhorn. Along the way I hand-stitched up a couple of easy courtesy flags for Latvia and Estonia. The summer season hasn’t officially started yet and many of the marinas have reduced staff and reduced rates, with no need to struggle to find a berth. The approaching summer solstice on June 21 will begin the decline of sunlight hours, but an increase in holiday-makers. Leaving Farö at 3.30am as the sun rose, we had a ripper sail across to Ventspils in Latvia. Here is where we’ll commence our anti-clockwise trip around the Baltic. Aside | This entry was posted in 2018, Sweden and tagged Gotland, Kalmar, Orland, Sweden, Vaskervik, Visby. Bookmark the permalink.